Check out the video of our demo here. 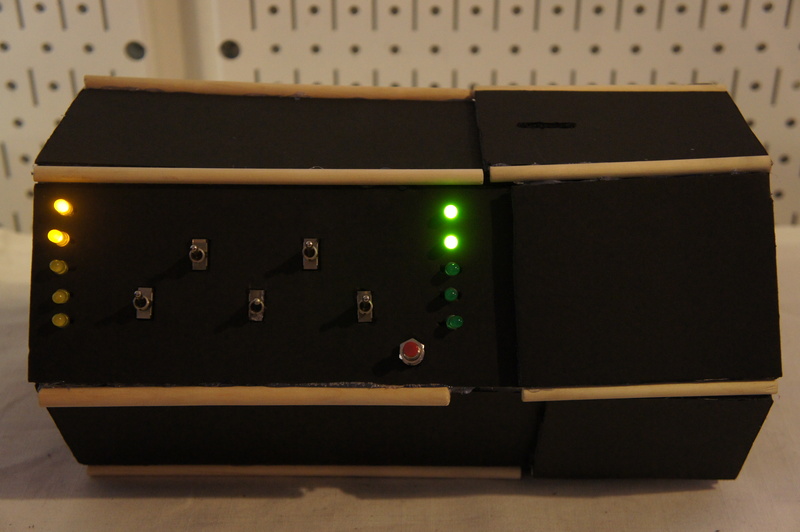 Basically, if your code is right (as computed by an Arduino Mega), we send a signal to a linear actuator that connect the inside of the box to the lid. Relatively simple mechanism. Can you open the Cryptotube? Or are you an utter noob? And our hints you’ll have to heed. Guess too much, the code will renew. Green will truly let you see. Red will offer the most insight. Lest your treasure begin to rot. Some of our classmates felt that with regards to the LED’s, green and red felt too much like YES and NO, so we changed that in the final project. Two of us have experience in game design, and the team was pretty concerned about the “Game mechanic” of the project: how would people respond to the code-guessing? Was it too difficult? Too easy? Boring? We tested different versions of the mechanic (changing things such as number of switches, what type of feedback you get, number of guesses allowed etc.) before coming up with what we have now. You can check out some of our testing here. We went through a number of different “versions” of the Cryptotube. For starters, none of us are very experienced with physical fabrication, so we brainstormed many different ways of putting together the tube before Tom Igoe and our TA suggested what we currently have. It was a good learning, experience though! 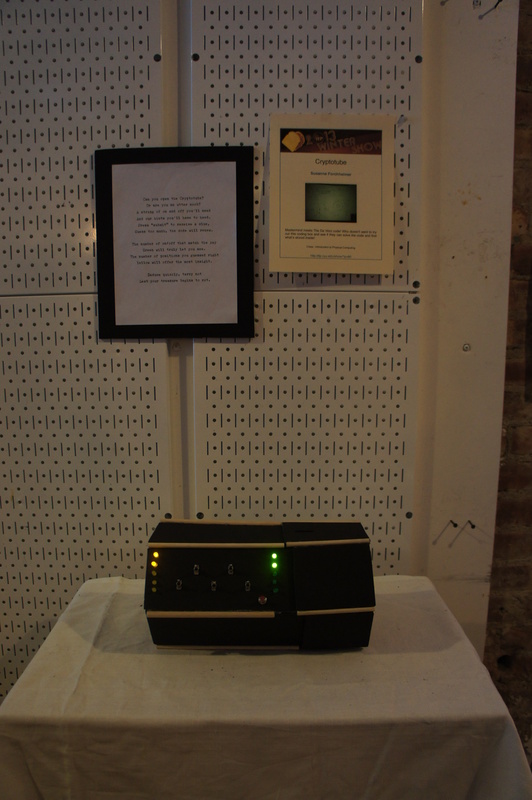 My own work focussed on the electronics, and some of the programming. The electronics was pretty exciting: I actually sat down and did a bunch of calculations to design a resistor array for our linear actuator (okay, the Math was equivalent to freshman-level Physics, but I was still excited about APPLYING it!). 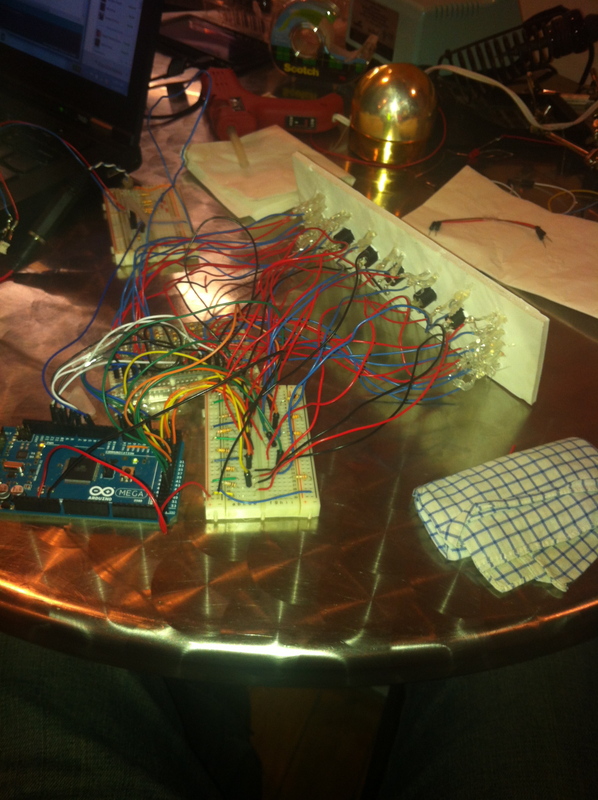 Here’s a look at the (very messy) electronics. And yes, that’s my handkerchief. boolean trueCode; //an int array to store the correct 4 digit code. Need to check syntax on how to set the size of an array! //CHANGE THE PINS TO WHAT EVER PINS WE’RE USING!! 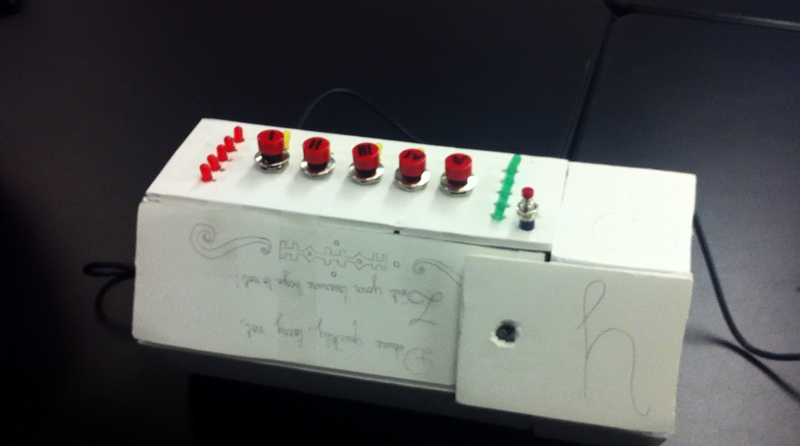 My team’s midterm project was an attempt to make an unusual musical instrument. You hit these gongs, and instead of the expected bass reverberations, you hear human song (currently my and my team-mate’s voices…). You can check out a video of the gongs in action here. After a good bit of work, we found that calibrating our piezo’s was the hardest part: their calibration kept changing depending on where we were, the number of people around etc. We did get the prototype to work, however! After having seen some of the midterms made by other groups, my group decided on making a game-like device for our final project. 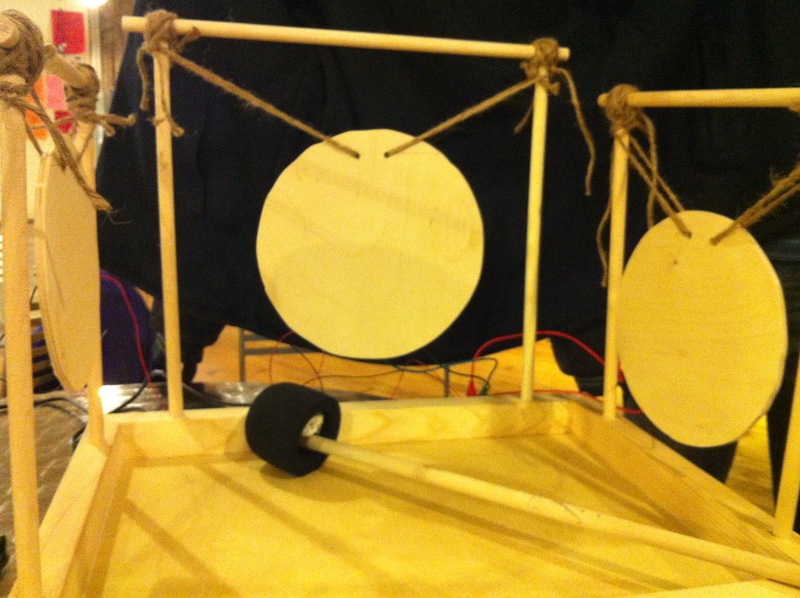 As in, the device will be far more interactive, and not simply reactive like our singing gongs (video pending!). We threw around a bunch of ideas and decided to do something like the game Mastermind. We’re not going to simply duplicate the game, but we like the feel of making connections and linking different nodes to each other and though we haven’t figured out the fine mechanics of the game, I think we’re onto something really interesting! 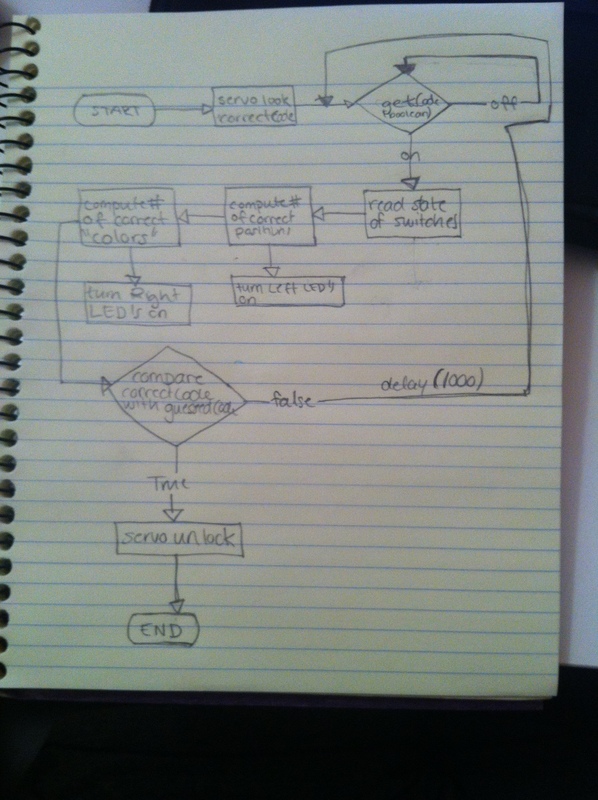 Before ITP, I had had some experience with Interaction Design. I had both taken classes and worked at Tiltfactor Lab, a game lab that emphasizes games for social change. Focusing on Game Design, I worked a lot with what Donald Norman would call “Behavioral Design”: how do players interact with each other and with the game system? What can you do to motivate them to take certain actions, or to encourage a certain style of behaviour? What mechanics will provoke an “AHA!” moment? Through courses at ITP, especially Physical Computing and Visual Language, I’ve been thinking a little more about the physical design of things, which includes what Norman calls “Visceral Design”, and features that directly address the senses. I’ve scratched the surface of this type of design in my past life as a bioengineer (see my adventures with poop), but not in any great detail.As an example, my team’s midterm project is a set of singing gongs. We really want to enforce a serene, calming aesthetic and we’ve had to think about how qualities of the gongs that will reinforce this (such as the weight of the materials used, the type of mallet etc.). I’ve been reading Norman’s “Emotional Design”, where he talks about how the aesthetic qualities of a product can go a long way in making it a more usable product, and Timothy Samara’s “Design Elements: A Graphic Style Manual”, which is a great book with concrete suggestions about visual design. So yeah, that’s one of the major things I’ve been learning about physical interaction! 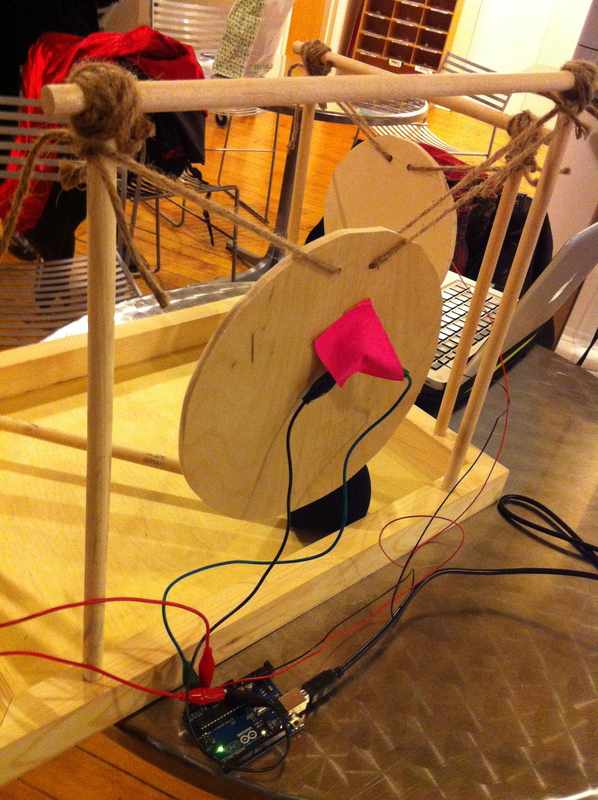 Susanne Forcheimer and I finally managed to complete our musical instrument! We wanted to make a device that you could scream into, which would then take your scream, add some nifty processes and output music. 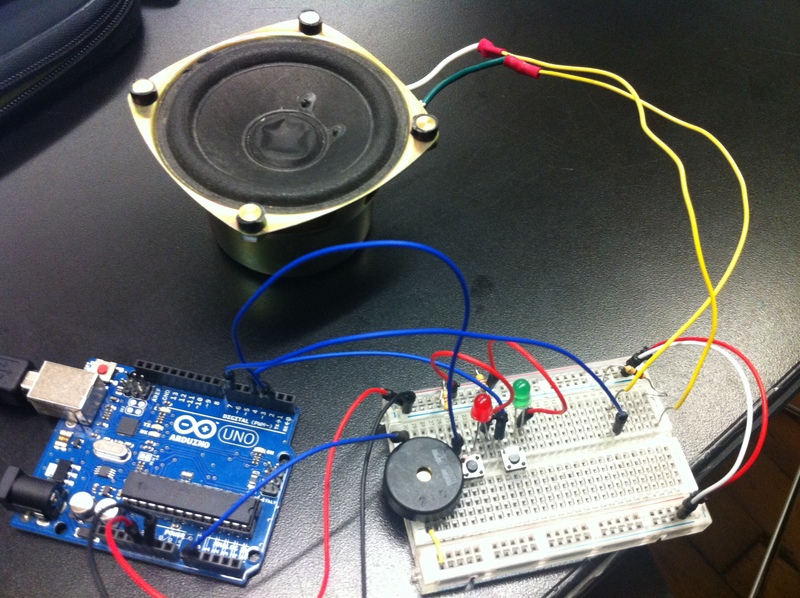 At first, we tried screaming into a piezo, with little effect. We tried using mics, which worked better, but then couldn’t find enough mics while we worked on it outside of class. 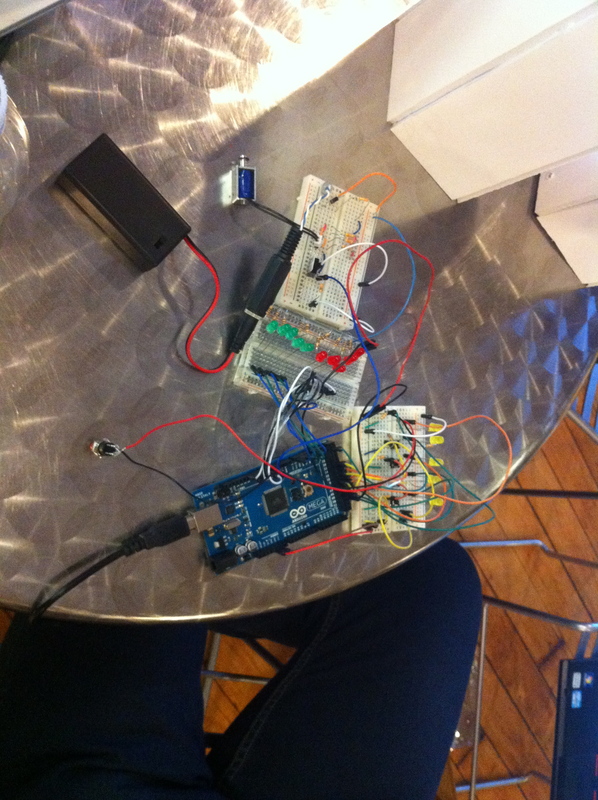 We finally went back to using a piezo, and the device has now become a tap-to-music-converter! 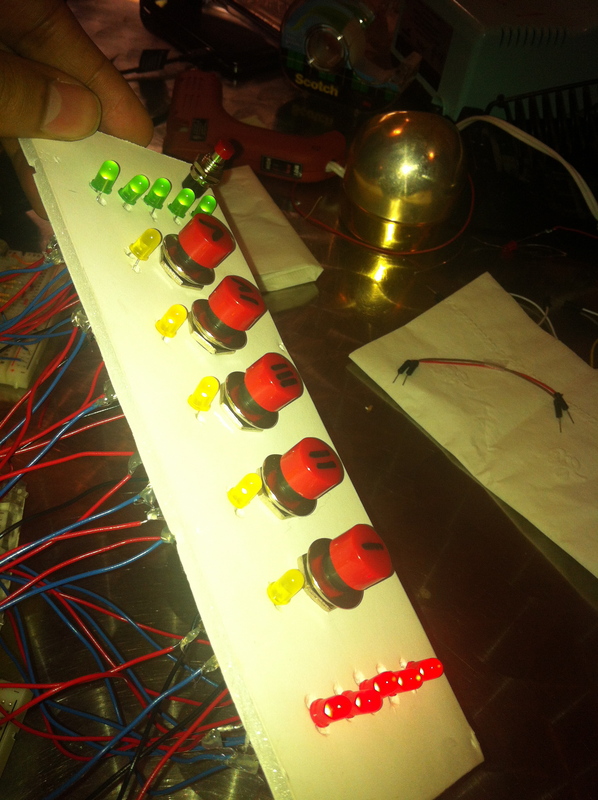 1) Press the “record” button (you’ll see a red light) and tap on the piezo a few times, in whatever rhythm you like. 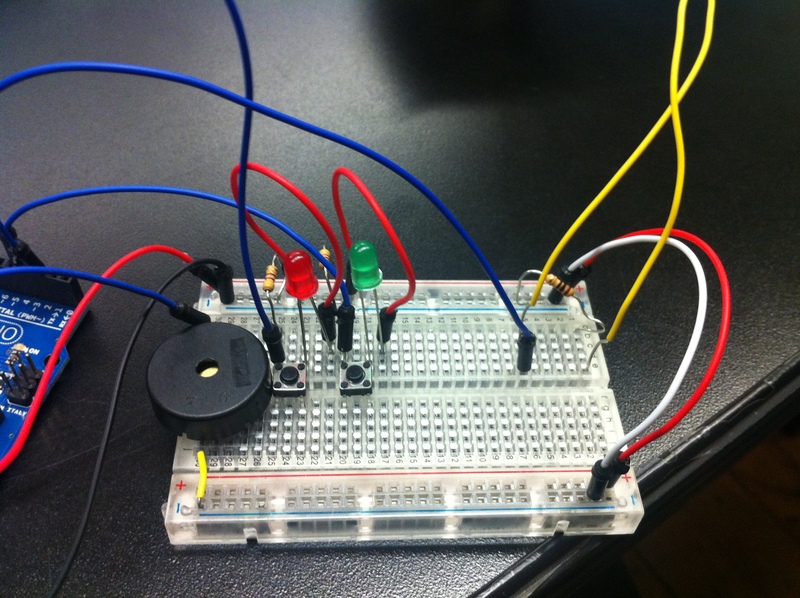 2) Press the play button and see your rhythm converted to music! 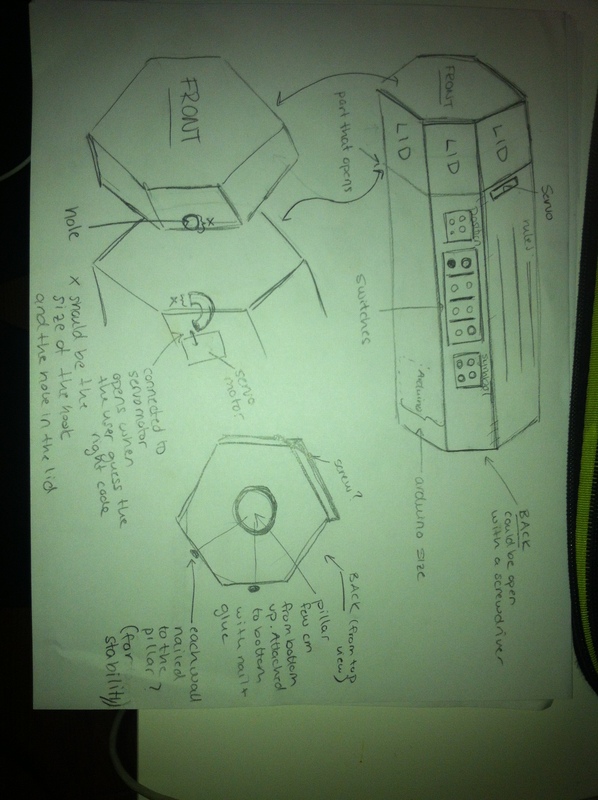 This week we were tasked with analysing the design of a device used by humans. Specifically, we were supposed to examine a public device. I creepily stared at people at ATM’s and subway-ticket-vendors, both of which failed to inspire me. 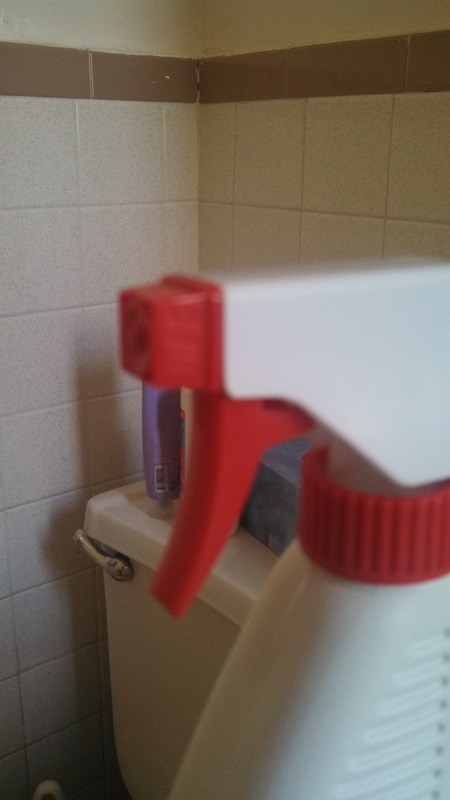 Then I noticed something right at home when my roommate and I tried to do some emergency cleaning after the sighting of a cockroach (it has since been dealt with, thank goodness). First off, the bottle is NOT an interactive device. Yes, you can argue that it responds to our input (it sprays out liquid when we pull the trigger), but Chris Crawford would, I’m sure, have something snarky to say about that. So much of what Crawford says is irrelevant to the bottle. 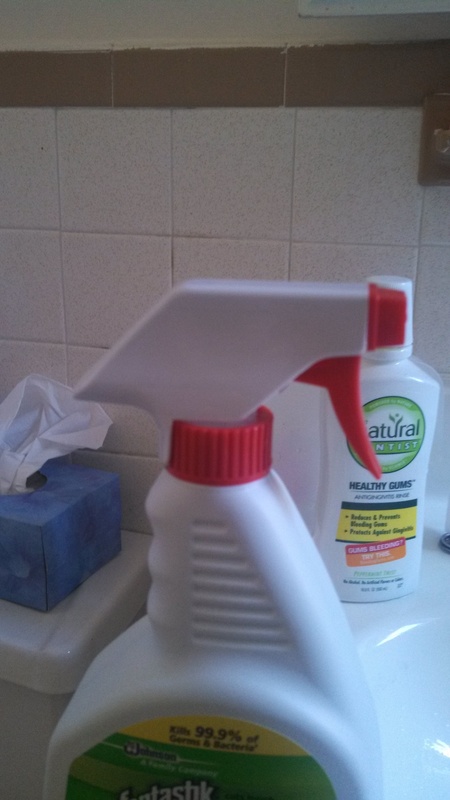 I’m more interested in how our humble spray-bottle relates to Donald Norman’s ideas of good design. 1) For starters, as household disinfectants go, it’s a pretty attractive bottle, and Norman talks about the importance of attractiveness in well-designed things. “Negative affect can make it harder to do even easy tasks: positive affect can make it easier to do difficult tasks,” he says. The bottle’s never going to earn an exhibit in the Met, by any means, but it’s not ugly. It has an sleek lines and a nice white colour. “I’m all about cleanliness,” it tries to say. It also has some nice, ergonomic grips that tell you where to hold it, and a trigger, which is just fun to use. Personally, though, I feel that attractiveness is not as important a feature in this particular case, because we’re unlikely to need to perform very many complex tasks with this device. It’s just point and shoot. To me, the aesthetics here are more marketing-related. But it’s attractive, and that earns it a plus on the design scale. The design does not lend itself to helping us understand this. The first thing I tried was pull the trigger repeatedly, with no effect. The bottle is designed to bring attention to the trigger, and triggers are culturally known to be pulled, so that’s not a surprising first instinct. Then, I tried turning the round, toothed, red component. This section immediately stands out as something that should be turned (it “affords” turning, in Norman’s words). And why not? It’s a) round, which implies rotation, b) grooved, which implies grip, and c) red, which makes it stand out from the rest of the bottle and screams, “Use me!” . Indeed, this portion is for turning, but it unscrews the whole top of the bottle, not what I wanted. So this device, while fails to follow one of Norman’s “rules”: the simple but not obvious thought of “making things visible”. 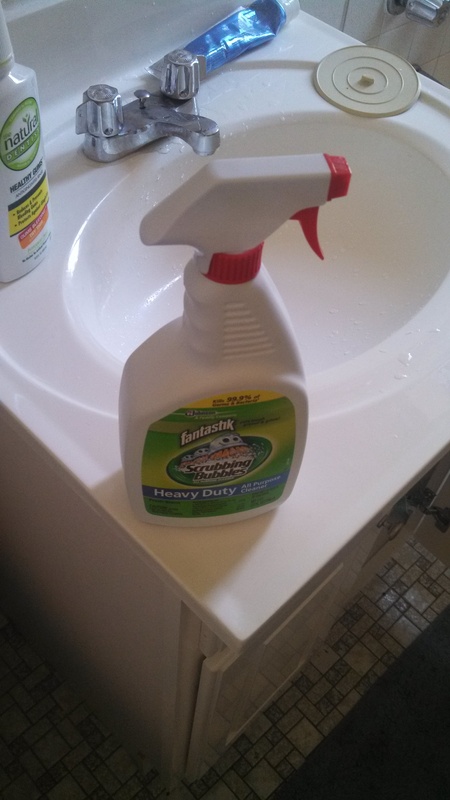 In its defence, once the bottle has been used for the first time, it’s simple and intuitive to use (the cockroach scared us and inspired a stricter cleaning regimen…). But as Victor puts it, imagine if we integrated this sort of manipulation into how we use technology. What if the interface to a 3D-modelling program included, along with a screen and stylus, a touch-sensitive lump of clay peppered with tiny sensors? This would be an example of “good” physical interaction: easing the entire range of sensing and actuating capabilities of our hands (or any other organ we might use to interact with something!). Of course, you don’t NEED something to be “interactive” to be effective. For example, many people don’t like video-games with too linear a plot. While I agree that the power of games lie in the decision-response cycle players have with the system, many wonderful but pretty linear games exist. Reacting and participating in a narrative, if it’s engaging and well-told, has its merits!